My precocious daughter teaches me something new everyday. (Patience is a popular lesson and I often get a lot of homework from her.) This past week, she and I have been engrossed in Play-Doh fun and the intricacies of what this non-toxic neon substance can do. In the middle of making a blue nose to put on my face (It never stays!) to make her laugh, I realized that this stuff has a lot in common with diabetes. 1. When you see all those cans of Play-Doh and the Play-Doh tools for the first time, you’re overwhelmed. Newly diagnosed PWD (people with diabetes) and their families are often overwhelmed with the choices and options to manage diabetes. Multiple daily injections? Insulin pump? Continuous glucose monitor? What brands are best? What insulins are best? Much like playing with Play-Doh is best when you’re with someone else (It’s way more fun! ), diabetes is a group activity. Your playgroup is your medical team and your family and the DOC. You decide what works for you and get your playgroup to help you make it. 2. You can shape it into anything you want it to be – and then make something else. Want to make a purple snowman riding a purple and green mottled dinosaur? Totally can do that with Play-Doh. If you don’t like the way it came out, then start over. Diabetes isn’t a clay ashtray that you glaze and fire in a kiln, immobile and immutable until it’s thrown out when you leave for university. (Why was that a popular thing to make at summer camp? My parents didn’t smoke, but I still made one…) You have to keep trying to make it into something that works, pinching and poking and rolling it. Even if you like what your masterpiece looks like today, next year, you know that you’ll need to rework it into something else. My diabetes management looks nothing like it did thirty years ago when I started playing with it. In fact, it doesn’t even look the same as it did six months ago. 3. There are many Play-Doh colors, but they often get mushed into one big ball. Doesn’t matter in the end; it’s still Play-Doh. Type 1, Type 2, LADA, gestational… at the end of the day, it’s diabetes. If you don’t want to mix your colors up and keep them in little cans on the shelf, fine with me. I, however, must have gobs of Play-Doh to make beautiful things. That’s what our DOC is – a beautiful thing with many gobs of different colors. One can of Play-Doh? Boring. Eighteen cans of Play-Doh? It’s party-time! 4. It gets hard if you don’t play with it and take care of it. The Kid is in constant movement. She’s a toddler, so she wants to do EVERYTHING! NOW! ALL AT ONCE! – and we often buzz out of room, leaving bits of colors in small and large hunks strewn in our wake. If I don’t pick it up later, it’s not pleasant, especially if you pick it up with your foot. Ow. It crumbles and it’s just not fun to play with anymore. Try as you might, you can’t ignore diabetes. It gets difficult to manage if you’re not taking care of it – and even doing the bare minimum is better than nothing at all. If you ignore it, you’ll end up stepping on the small pieces, which hurt a little – and the larger pieces, which hurt a lot. 5. 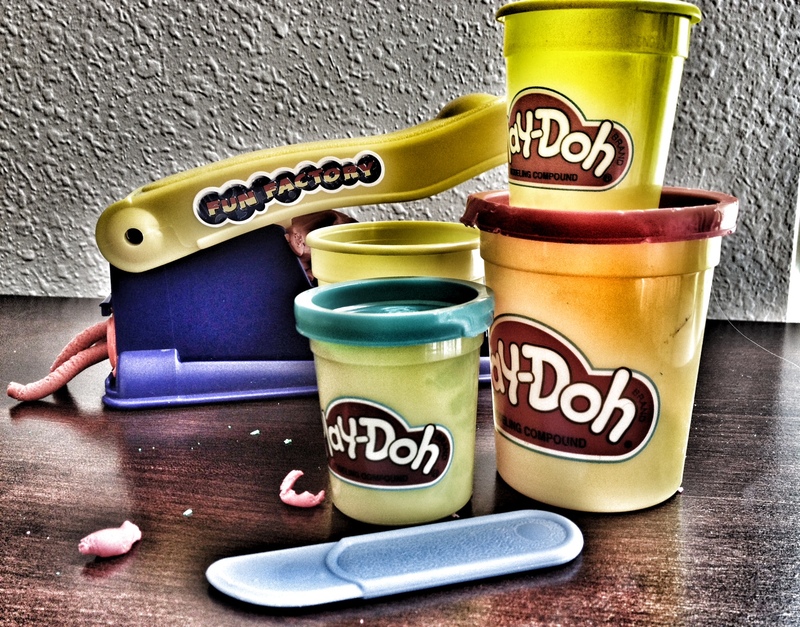 You can revive Play-Doh and play with it again. It’s never to late to start taking care of yourself, even if you don’t think it’s possible. If you’ve hit the diabetes burnout wall, it’s totally OK to step back, grab a single can, and start slowly to massage your mind and your body back to where it needs to be. I’m living proof that it’s possible. You’re my hero for making this analogy. Thank you, Kid, for the lesson! You almost make diabetes sound … dare I say it … fun? I may just have to grab some Play Doh on my way home tonight. Thank you for the inspiration. you’re like a genius. I adore you. I tried as hard as I could to choose a favorite lesson. I couldn’t choose – all good. Hee, hee – no play doh at our house anymore but – could almost smell it while reading this!